Anna Bolton | Greene County News Salt is piled high in the Greene County engineer’s barn off Progress Drive Jan. 17 ahead of a wintry forecast. 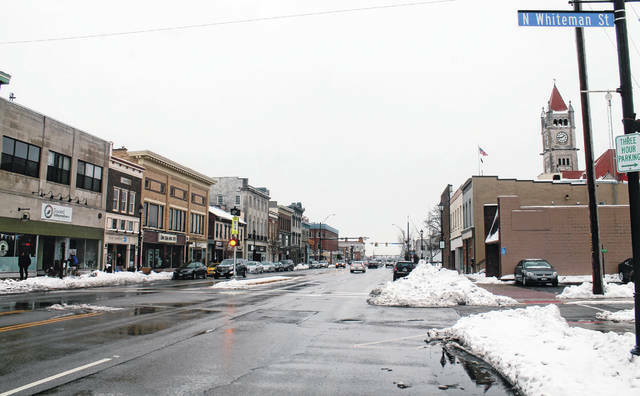 Passersby walk and drive down Xenia’s Main Street, cleared of snow, Jan. 17. But snow plows may be busy again soon. 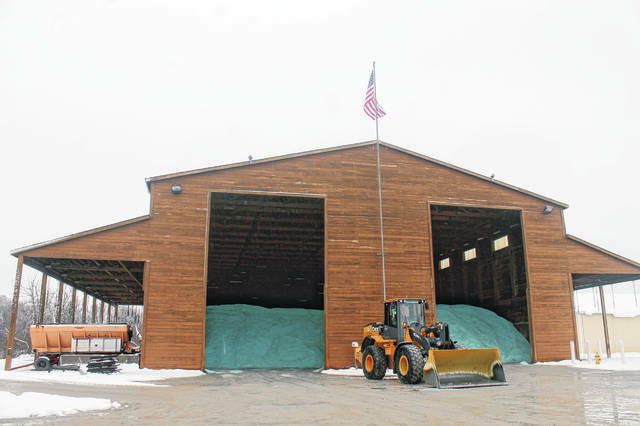 GREENE COUNTY — With a barn full of salt, Greene County’s engineer is ready for this weekend’s potential storm — but urges drivers to give the snow plows space. Geyer said his crews are preparing for what could be cold temperatures, rain or snow the same way they always prepare for a storm. “We’re making sure we have plenty of salt, making sure we have plenty of Beet Heet, making sure trucks are in running order,” he said. The county barn off of Progress Drive is full with 3,000 tons of salt, and 11 trucks are ready to go. Beet Heet will get sprayed on the salt as it leaves each truck before hitting the pavement. The county engineer is responsible for the maintenance of about 325 miles of roads. “I’ve got plenty of supply — that’s not a problem,” Geyer said, explaining that he had a partial barn’s worth of salt leftover from last year. He said he was able to fill up the rest of the barn on last year’s contract at $48 per ton. The county has used up more than half of the barn this year so far, so he’s replaced the rest with new salt at $92 per ton. At the Jan. 17 county commissioners meeting, Geyer said a normal winter takes on average 7,500 tons of salt. He said the cost of salt could go up even more next year. A few years ago he saw the highest price of his career at more than $140 per ton. If salt runs out, Geyer said, he’ll order more. https://www.xeniagazette.com/wp-content/uploads/sites/32/2019/01/web1_SnowTruck.jpgAnna Bolton | Greene County News Salt is piled high in the Greene County engineer’s barn off Progress Drive Jan. 17 ahead of a wintry forecast. https://www.xeniagazette.com/wp-content/uploads/sites/32/2019/01/web1_MainStreet.jpgPassersby walk and drive down Xenia’s Main Street, cleared of snow, Jan. 17. But snow plows may be busy again soon.